Our line of wooden plaques are available in many finishes, including walnut, cherry, oak, bamboo, and acacia, as well as “polished piano” finish walnut and rosewood. Engraved plates can be used to convey your message. We can also engrave your text and logo/emblem directly into the wood and color-fill the engravings, or leave as-is for a rustic look. Our decorative plates come in brush gold, brush silver, brush bronze, shiny mirror gold, and shiny mirror silver. We also have black plates with gold and silver engravings, and white plates that can be color- printed. Our paint options for color-filled wood engraving include gold, bronze, silver, white, and black. From individual awards to office directory plaques, we’re sure to have something in our catalog to meet your needs. Our smallest plaques are just a handful of inches long, while our largest are over two feet in length. We have a diverse selection of shapes to choose from, outside of the traditional rectangle, such as shields, scrolls, ovals, filigree, frames, and emblems. Our unique plaque options include our floating plaques, which feature a dual-layer sheet of clear, engraved acrylic or glass suspended above a black or photo-insert base. 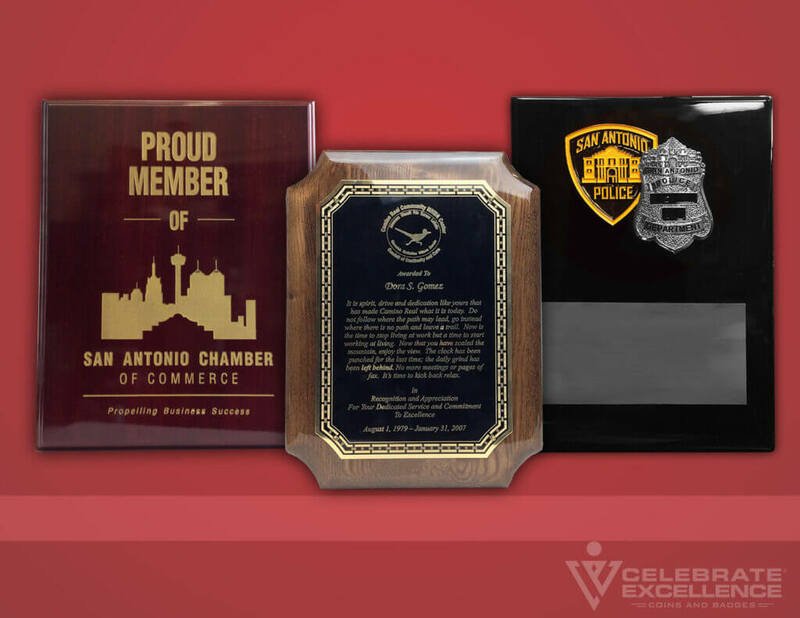 Other options, such as our SAPD emblem plaques, come with mounted addons, like the metal color-filled Alamo shield and SAPD Badge sigil (available in gold and silver). We also carry resin plaques, which are cast and painted to resemble stone and other such materials, as well as plaques constructed from cast aluminum. The signature plaque of Celebrate Excellence is our acacia wood plaque, richly banded with dark and light wood grain, sanded smooth, and backed in velvet for scratch-protection. Over an inch in thickness, this hefty plaque is both rustic and classy in its presentation, and the overall size leaves plenty of room for a custom, color-filled engraving.